Takashima Brewery, which is primarily a sake brewery in Numazu City, Eastern Shizuoka Prefecture, Is making itself another name with its superlative shochu. Using thier sake white lees, they have already put no less than four different brands on the market! 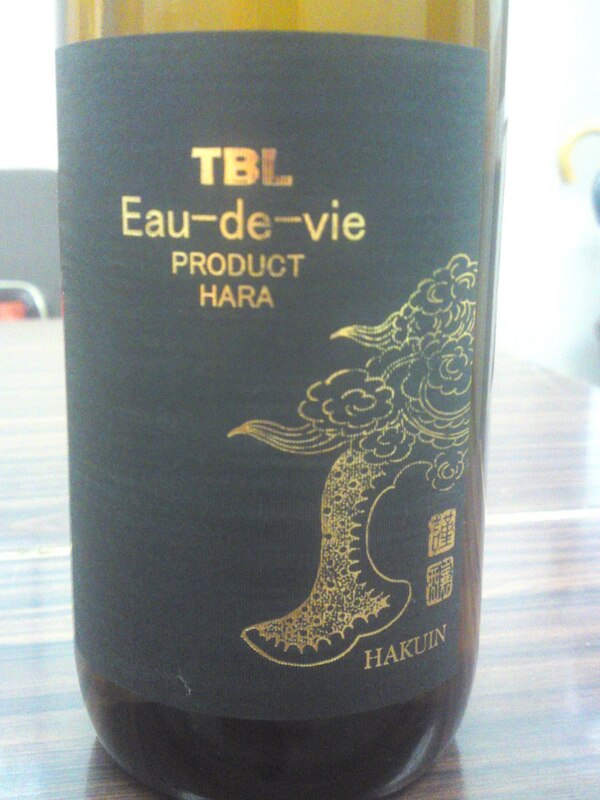 TBL stands for Takashima Brewery Limited and Eau-de-vie (“Life Water”) is French for Life Spirits! At 255 alcohol (not 25 degrees) it is pretty heady but normal as far as alcohol content is concerned! 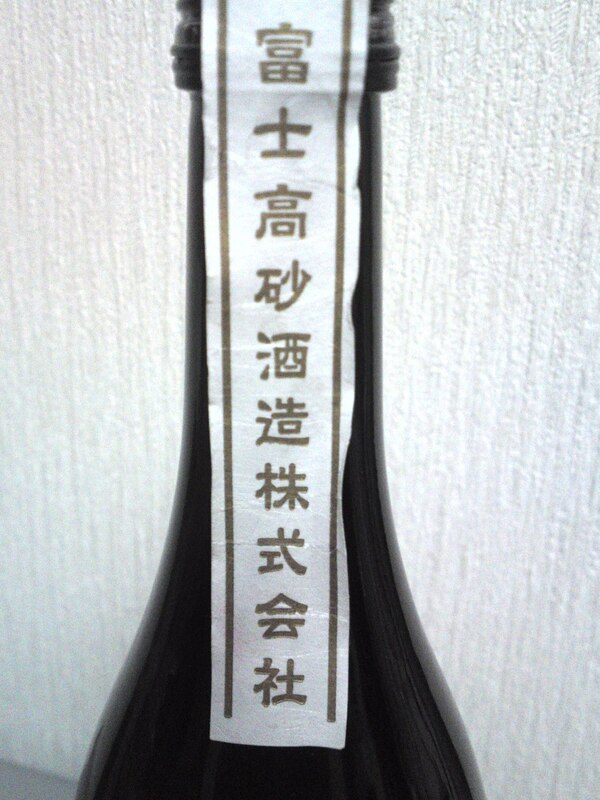 My dear friend Sissi will be glad to hear about another shochu from Shizuoka Prefecture! 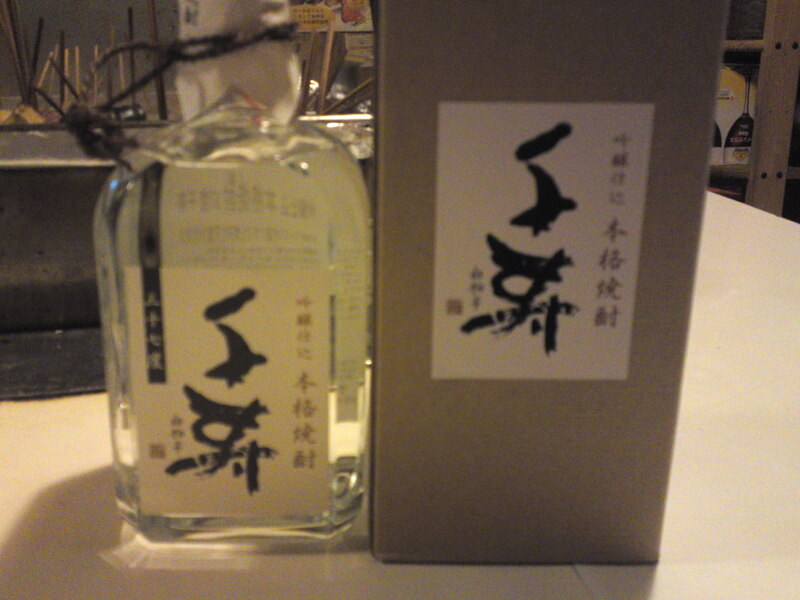 Rice Shochu made with ginjo sake white lees as well as rice and rice kouji. Aroma: Comparatively mild and discreet. Dry. Fruity: notes of bananas and custard. Taste: Strong well-rounded dry attack warming up back of the palate. ***Tasted at room temperature: Dry and fruity. Complex. Faint bananas and dry almonds. very elegant approach. Disappears quickly on a softer note with more dry almonds. ***Tasted on ice: Reveals new facets as it gradually warms inside the mouth. Bananas, macadamia nuts, hints of dark chocolate. Overall: Extremely elegant sake white lees (riceis a different license! 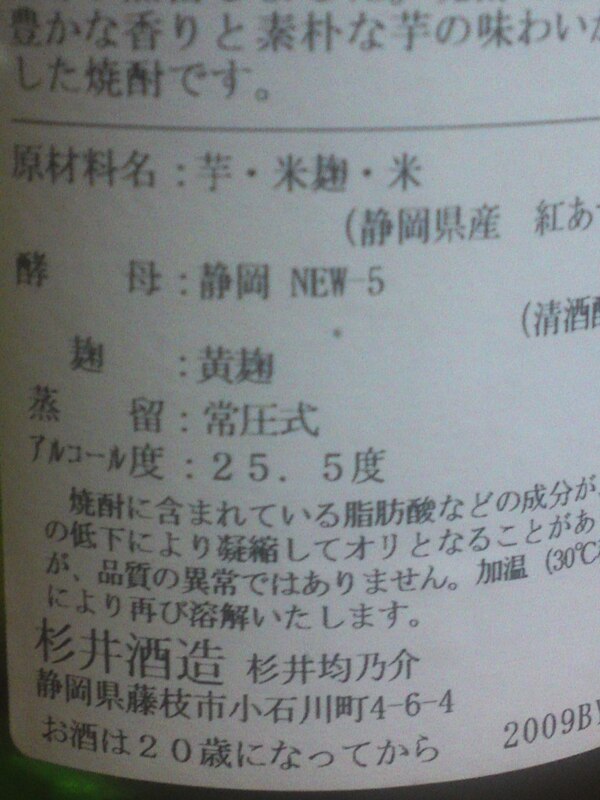 ), typical of Takashima Brewery! Can be thoroughly enjoyed on its own or poured over plenty of ice. Great with Perrier or any high quality mineral water. No need to mix it with anything else! A shochu for all seasons and both genders! Shochu loving ladies will find it very elegant! 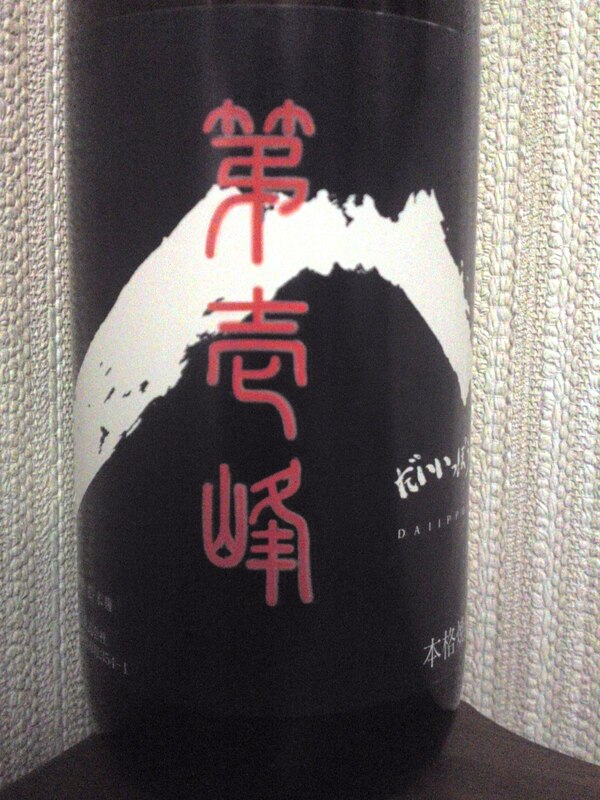 Once again Sissi should be interested with this shochu made in Shizuoka! 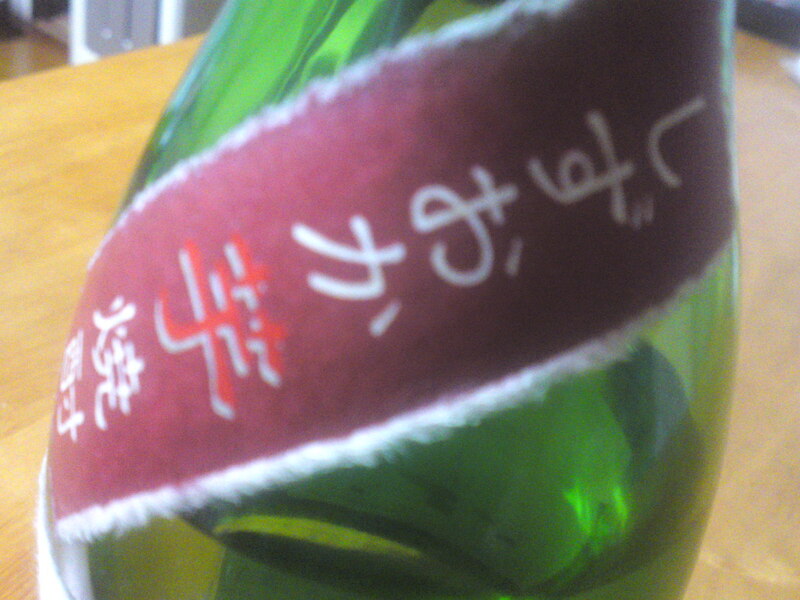 it is a shichu made by Senju Brewery/distillery in Iwata City with sake lees. 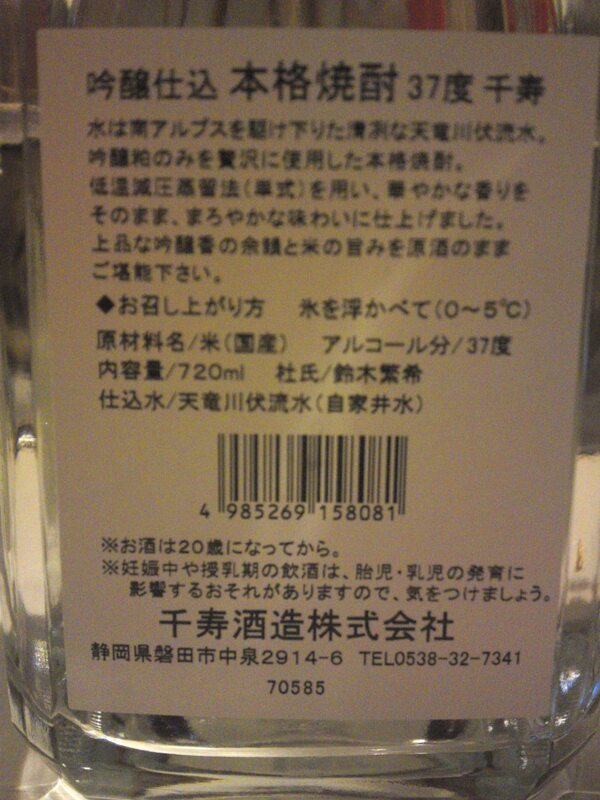 Apparently making shochu directly from rice requires a different license! 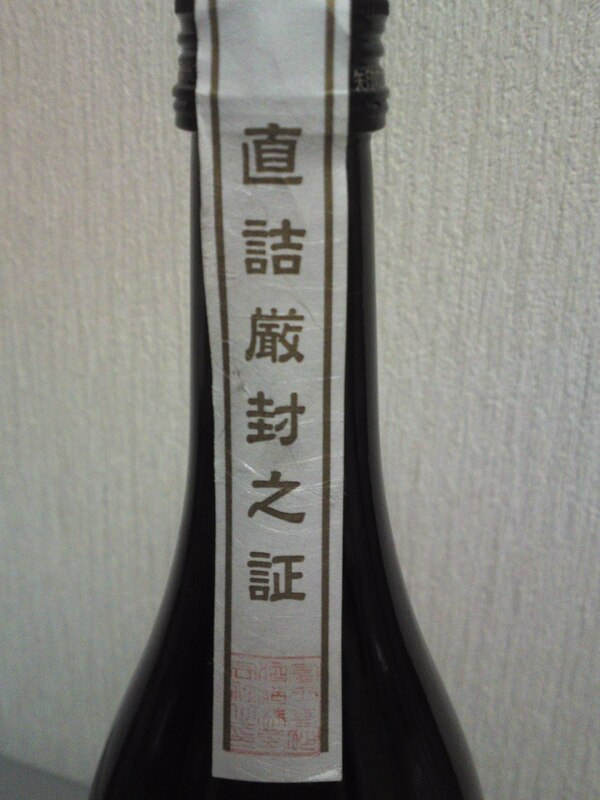 Otherwise it still can be called a rice shochu although by law it is a sake white lees shochu! Taste: Very well-rounded and fruity attack. Strong alcohol but very elegant and easy to drink. Complex and very difficult to catch. Dry chestnuts, dry custard, pears, fresh cream. Stays very dry on the palate but tends to disappear on a sweeter note, this being certainly due to the variety of yeast used to make the sake whose white lees have been distilled into that shochu. Extremely sophisticated for a shochu! Overall: Best enjoyed on its own despite the strong alcohol at room temperature. The distillers advise to enjoy it straight on plenty of ice. At the most could be mixed with water. Anything else would be tantamount to infanticide! Drink it away or before/after a meal! The perfect nightcap? Mind you it is strong so better use a chaser before hitting the sack! Takashima Brewery in Numazu City does not brew only superlative Japanese sake but also distill some incredibly extravagant rice shochu as well! Their latest jewel is Dai Ippoh! When you look at the simple calligraphic design you will understand it represents the nearby Mount Fuji! Dai Ippoh/第壱峰 (old-style calligraphy) means “The First Peak”! Aroma: Almost sweetish and spicy. Alcohol. Rice. Taste: At first sweetish and complex attack. Does not linger long in mouth or under palate. Very clean, elegant and fruity approach. Alcohol impact relatively soft with fruits appearing with each new sip. Overall: A very elegant rice shochu which should be drunk on its own first at room temperature without ice or water for a true appreciation and taste discovery. All the qualities and more of a superlative rice shochu. At the most pour it over a lot of ice but there is no reason to mix with anything! Sugii Brewery/Distillery in Fujieda City has been noted for quite some time as producing not only top-class sake but alsoo shochu of a superlative level. They also have the merit to use local ingredients whenever possible! 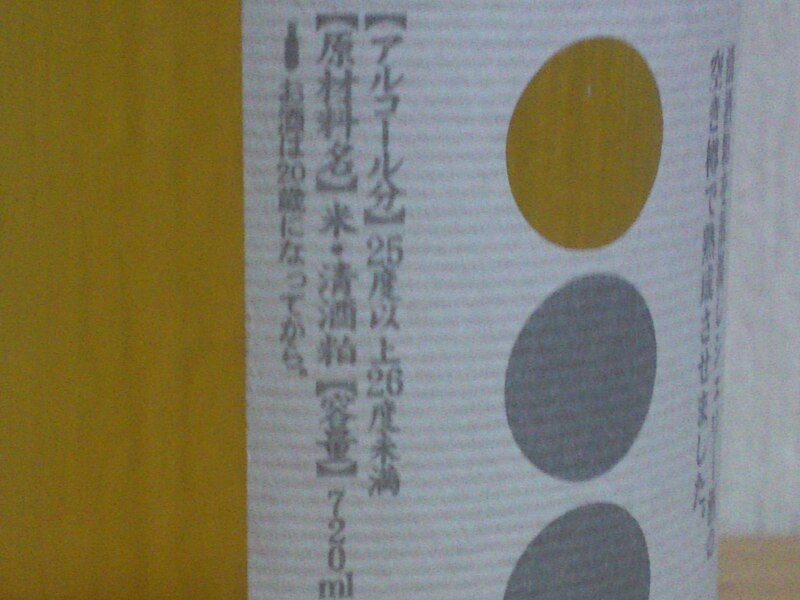 The imo, or satsuma imo/薩摩芋/sweet potatoes used in this shochu are exclusively grown in Shizuoka Prefecture! Taste: Strong but smooth attack. Lingers for a while warming up back of the palate. Sweet but dry on the tongue. Pineapple, nuts, dry almonds, walnuts. Drunk on its own or on plenty of ice mainly reveals a dry nutty, almost sweetish strong accent to rapidly grow into a very dry invasion of the palate. 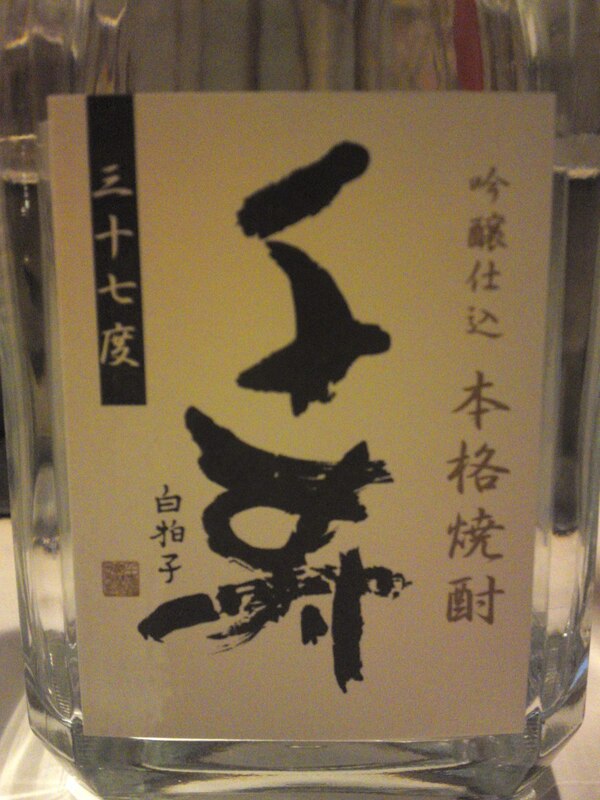 Overall: A shochu more elegant than expected! Its strong nutty taste is very pleasant and marries well with any food. I personally appreciate it on its own poured over a lot of ice like I do for any higher quality shochu, although great with the addition of lemon or lime juice or mixed with Perrier water! Takashima Brewery in Numazu City has been justifiably considered for the past few years as one of the most daring Sake Breweries in Japan. Not only content with producing with nationally recognized sakes, they also make use of the sakekasu/white lees of their premium sakes into some extraordinary rice shochu! Having distilled the sakekasu into shochu spirits they store the latter in sherry barrels inported from Spain to mature for at least two years. The result is a unique nectar the color of wood. Actually, the first time they submitted it for registration with the Japan Bureau of Taxes and Excise, it was refused for the somewhat pernicious reason it was too dark and resembled too much to whisky! Aroma: Strong. Alcohol. Plums, oranges. Disappears quickly warming up the back of the palate for a long time. Fruits keep reappearing with every sip. Very reminiscent of whisky and anturally dry sherry. 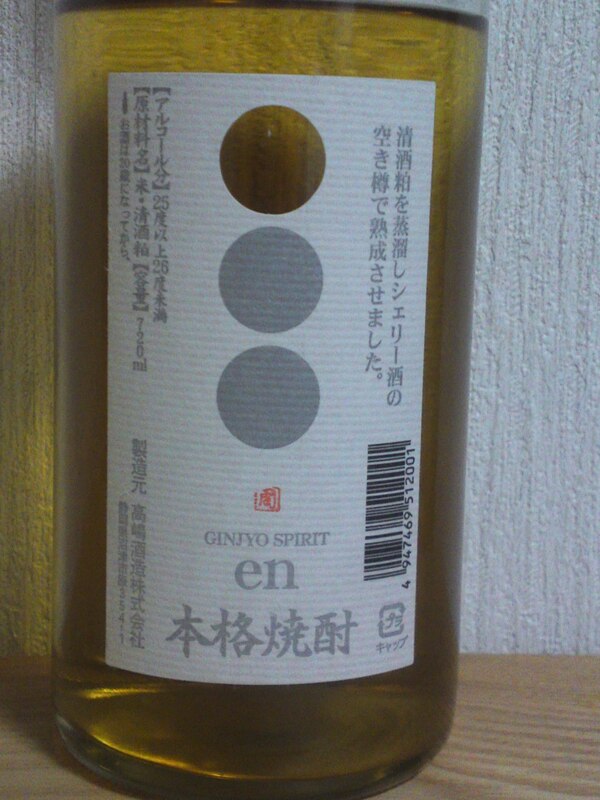 Overal: Extremely elegant and rare shochu! Probably a unique taste in the whole of Japan. So complex that it requests many a sip to properly discern it. Should be drunk poured over a lot of ice. Mixing it with water, or anything else for that matter, would be tantamount to infanticide! Since Yasatei Restaurant has Doman rice shochu on its list I took the opportunity the other day to conduct a tasting while enjoying the food! 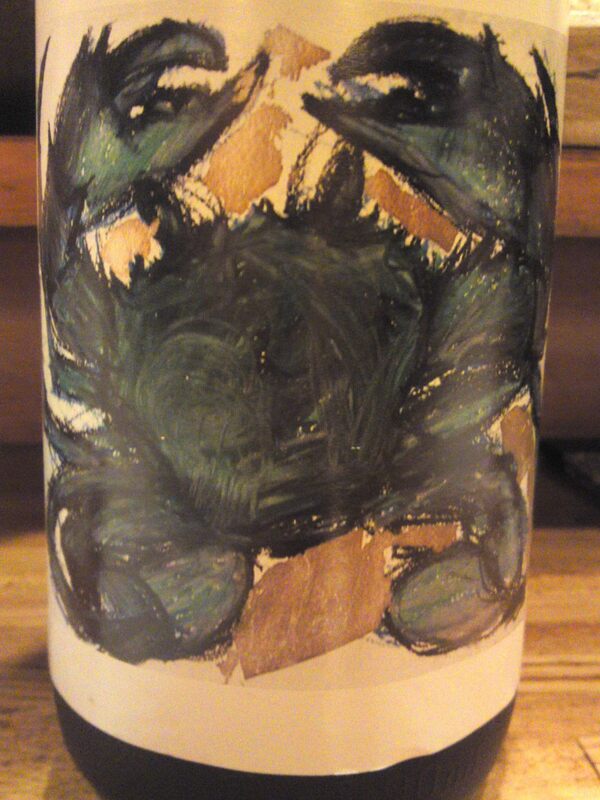 “Doman” is the name of a (very expensive) crab solely found in salt water Hamana Lake in Hamamatsu City. 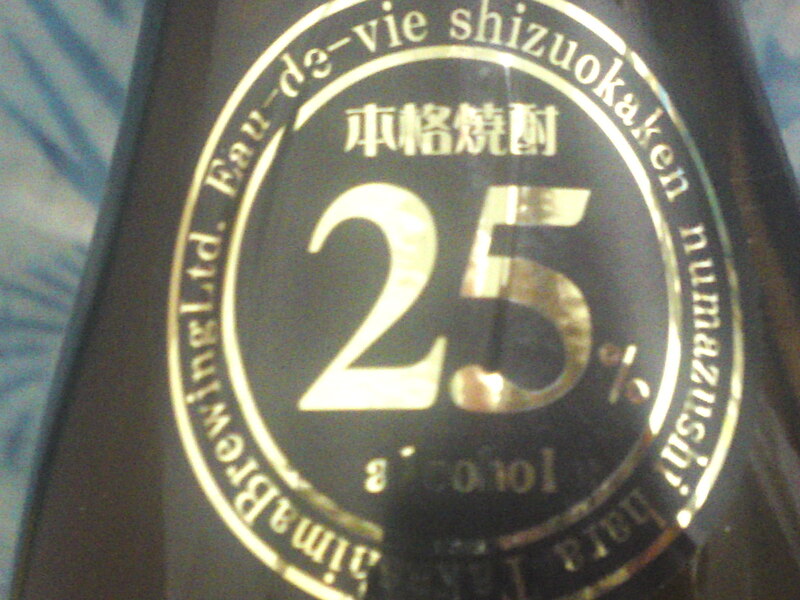 It is brewed by Hamamatsu-Tenjingura Brewery which also brews (mainly) sake and beer, and also liquors! 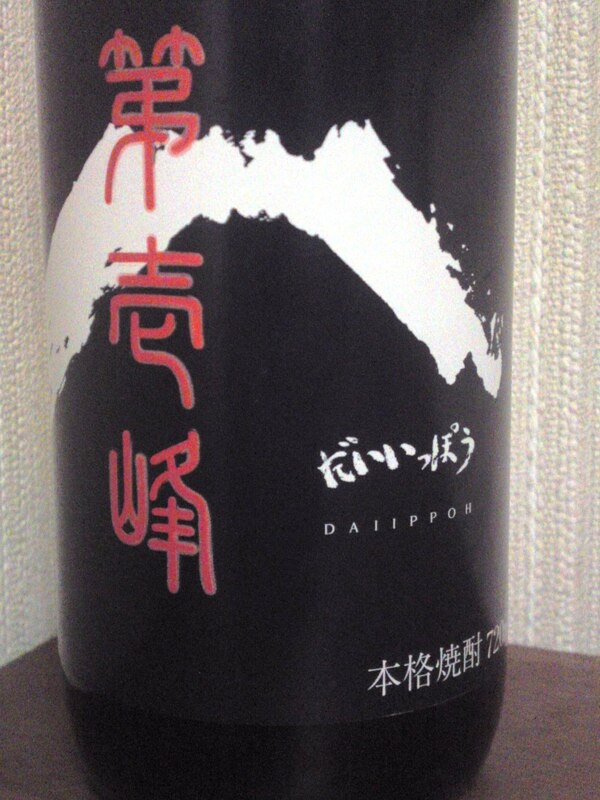 Doman is a rice shochu made with the best sakekasu/white lees of the Brewery by their brewmaster who is a lady! 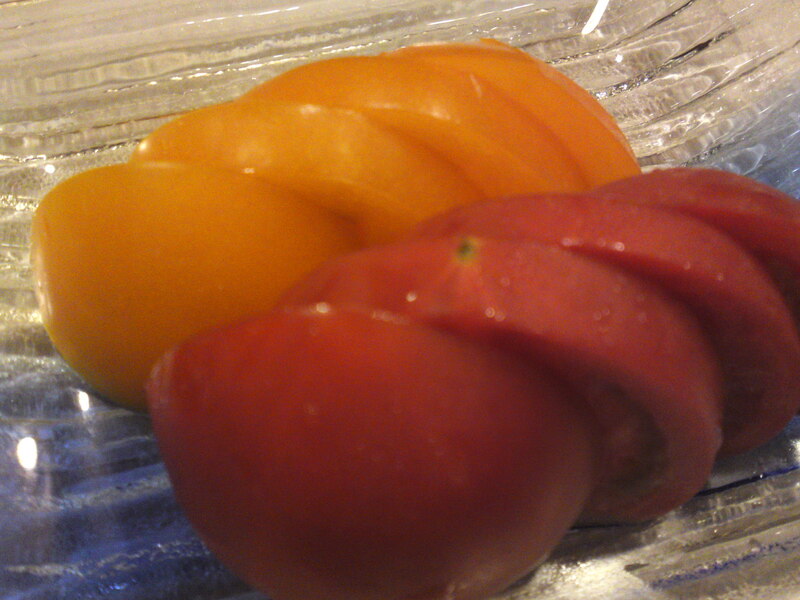 To help with the tasting I ordered some Shizuoka-grown tomatoes! The red tomato is “Ameera” variety celebrated for its sweetness. 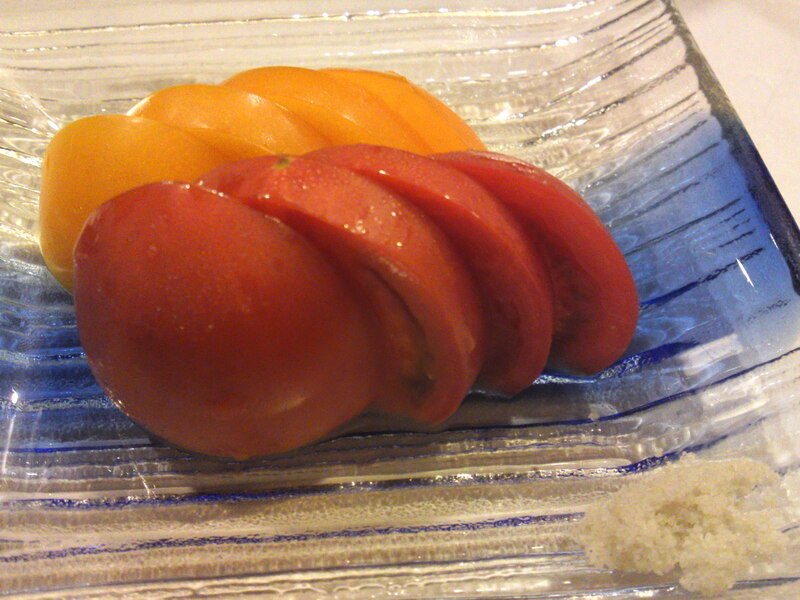 The orange tomato is a variety grown organically by Shizen no Chikara Farm! Taste: Starts with a soft attack to amplify into a warm pleasant invasion of the palate. Complex. Fruity and dry. Custard. Stays dry all the time although taste tends to fluctuate into sophisticated notes of coffee beans. Marries well with food, especially vegetables salads. 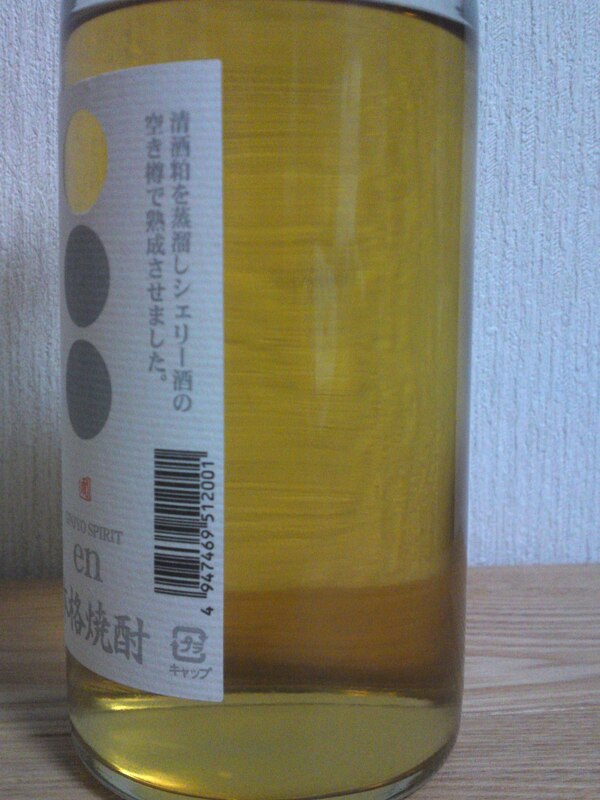 Overall: A very pleasant shochu which does not need to be mixed with anything else. Best appreciated poured above plenty of ice in a large glass! Marries so well with vegetables! As foreigners, especially not living in this country, seem to be interested in Shochu like my new friend Sissi in Switzerland I thought it was about time to introduce (actually re-introduce) the shochu made in Shizuoka Prefecture! Although 10 out 28 sake breweries in Shizuoka Prefecture also distill an aggregate of over 40 shochu, they are not well known (actually rare) in Japan as quantities are comparatively small and also because they are simply extravagant! They are all true shochu/honkakushochu/本格焼酎 but they do not always follow the pattern of the shochu made in Kyushu island for example. All rice shochu here is either made from the polished rice leftovers or the white lees/sakekasu/酒粕 left after the sake has been pressed. This shochu was distilled from the white lees left after the sake was pressed and with water from Mount Fuji, hence the name “Fuji no Tsuyu/富士の露 or The Dew of Mount Fuji”! The label was re-designed last year! Aroma: Fruity and dry. Alcohol. Custard, vanilla. Taste: Dry strong but pleasant attack. Very pleasant even on its own. Lingers for a while with notes of Macadamia nuts. Overall: As far as rice shochu comes it is just too extravagant. I really enjoyed it on its own or with plenty of ice. Beautiful with chilled Perrier, too. No real need to mix it with anything else! It shows too many facets to interfere with! The kind of shochu ladies would relate to! Sugii Brewery in Fujieda City has come up with yet another creation of theirs! But once again, it is a “limited edition”. You do have to keep all your senses alert to discover these bottles. Unlike Kagoshima Prefecture in Kyushu Island, Shizuoka-made shochu are not only exotic and extravagant, but rare and slightly more expensive. The labels certainly become collectors’ items! Shortish tail with a dry finish. 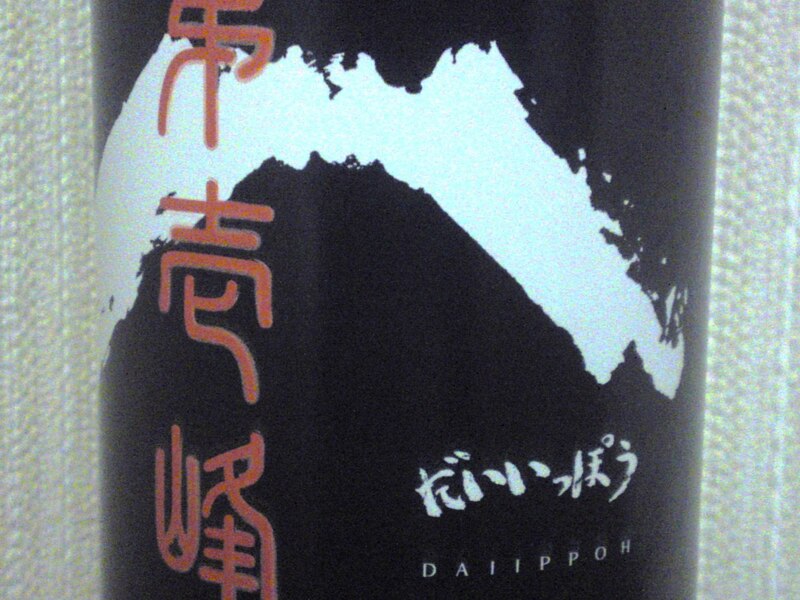 Overall: Unusual, clean, elegant shochu with lots of character and facets. Combination of Satsuma yams and potatoes out of the ordinary! The use of Shizuoka Sake Yeast gives it a very regional flavour! Best appreciated straight with plenty of ice! Wherever I go in Japan, I make a point to eat and drink local. 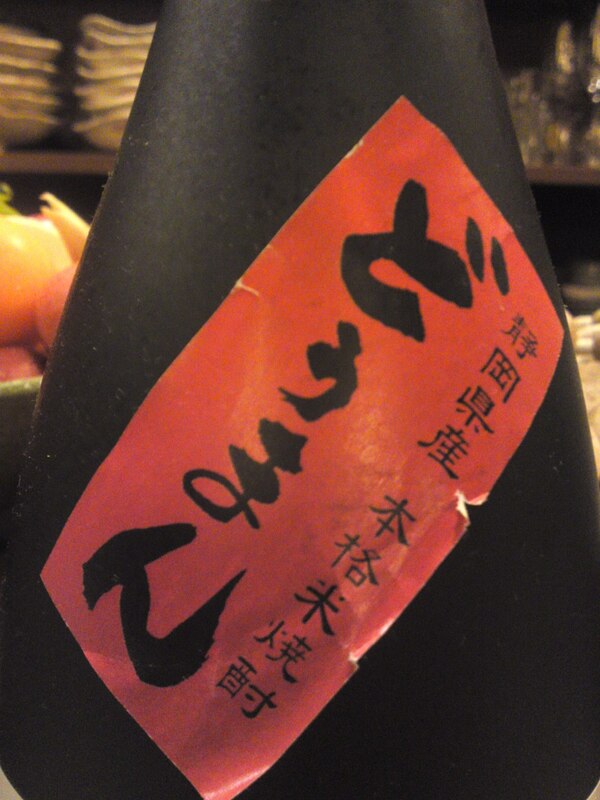 As there is no sake brewery, but only a shochu brewery, my choice was easy! Mitake Brewery is the only authentic Shochu Brewery in Yakushima Island. Others are only Breweries from Kagoshima Prefecture having sub-breweries to take advantage of the great water and tourists! Taste: Soft attack, clean. Shortish tail. Dry. Dry roasted nuts, coffee beans. Stands well to food with a sweetish undertone. Like all shochu brewed by Mitake Brewery, best drunk with ice only. Aroma: Very dry, clean, strong. Taste: Soft attack. Clean taste. Nicely warming up back of the palate. Dry. Shortish tail. Memories of coffee beans and nuts. Turns sweetish and deeper with food with memories of brown sugar. Alcohol: 35%. Genshu/no pure water added. Unaltered. Taste: Clean, deep taste. Fruity: brown sugar. Almost sweet. Keeps well with food. Turns drier with food. Shortish tail. 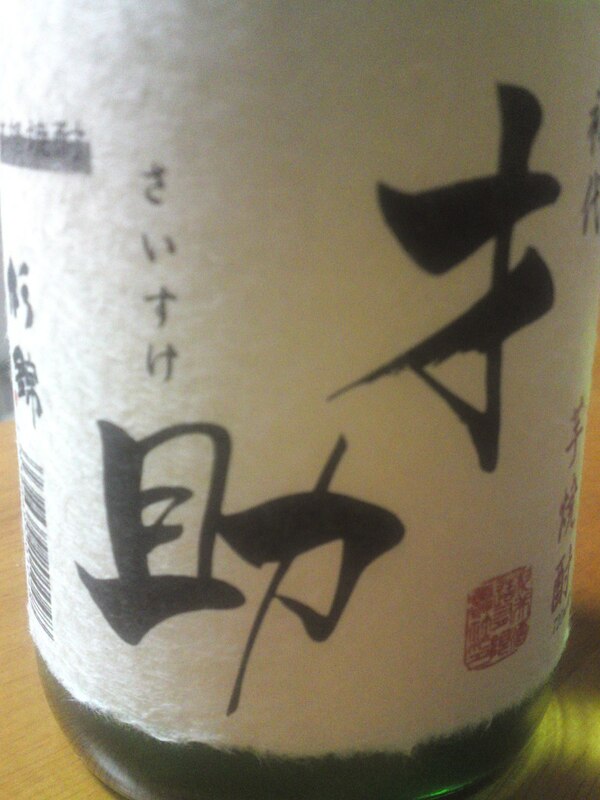 Comments: A fine, elegant shochu, which can be enjoyed for its sake or with food. 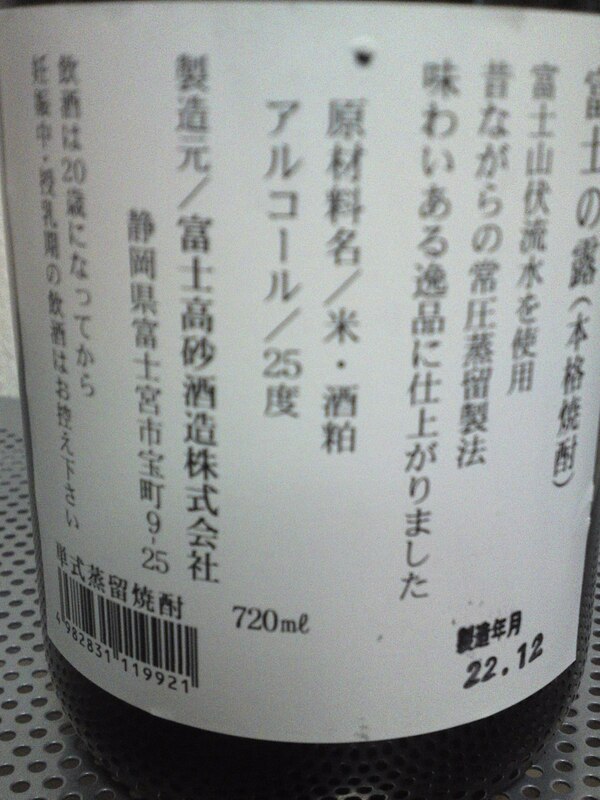 A very high-level shochu! Senju Brewery/Distillery announced on December 11th the creation of a new Shochu to contribute to the preservation of an endangered dragonfly species! Bekko Tonbo, or Bekko Dragonfly, is an endangered insect endemic to the region around Iwata City. 10 yen for each bottle sold will go to help its survival! The shochu is a kome/rice shochu made from rice and white lees used to brew top-class sake. 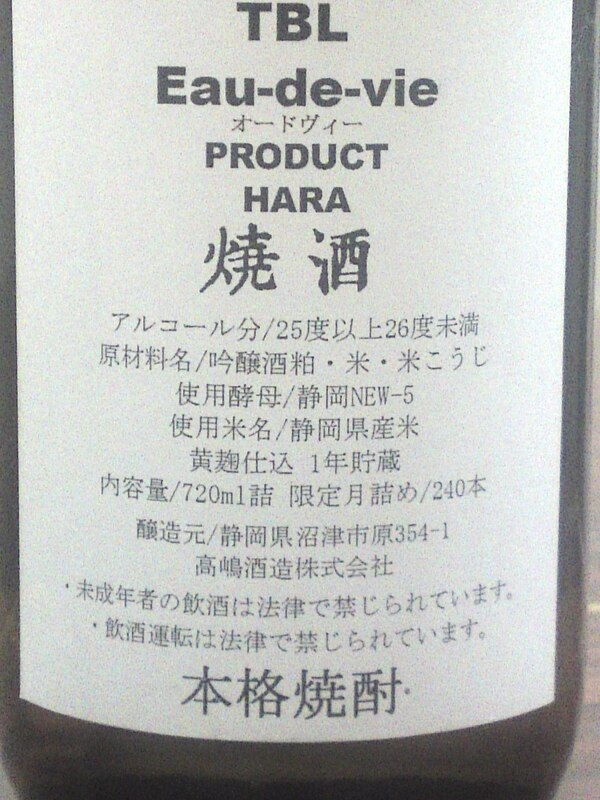 A 720ml bottle being priced 1t893 yen, it is very cheap for such an exravagant shochu. The brewery has concocted it as light, sweetish elegant brew best drunk with mineral water and ice!